Finance 101: What Is Risk? In my past articles, when talking about buying a given card, the concept of “risk” has frequently come up. I’ve seen some confusion in the comments about my use of this term, which has lead to misinterpretation of the information I’m trying to convey. Some people were under the impression that I was predicting, or even advocating for, a ban of a given card, whereas in reality I was simply weighing the possibility of a financial decision gone wrong. This week I’m going to clarify exactly what I mean by the term—what risk is, how it applies to the Magic market, and how to address it when making purchase decisions. I’ll end with some more topical thoughts regarding Modern Masters 2017 pricing and the best time to pick up reprints. To understand risk, first we need to take some time to outline the biggest major influences on card prices. Like anything else, Magic cards follow the basic economic laws of supply and demand. One of the easiest ways to illustrate this is with a reprint. Reprints introduce more copies of a card into the market. A higher supply leads to lower prices (all other things being equal), as sellers with extra stock try to undercut each other to move their excess copies. Another relatively common event that influences card prices are tournament finishes. When a card under- or overperforms respective to expectations, it will likely cause a price change. If a $2 card everyone thought was unplayable suddenly wins a Grand Prix, the price will increase as players adjust their perception of its value. Conversely, if a much-hyped card (usually from a newly released set) fails to deliver at a major event, players will lower their estimation of the card and it will drop. It’s easy to see how events like these affect supply and demand, but there are some other more indirect influences on a card’s price. Sometimes it’s as simple as the number of people trying to buy a deck. For example, when Modern Masters 2015 was released, Tarmogoyf and Dark Confidant both became much cheaper. Suddenly, more people could afford to buy the Jund deck, which pushed Blackcleave Cliffs up in price. The same thing happened more recently with Eidolon of the Great Revel in response to the reprint of Goblin Guide. In both cases, one reprint led to another card that dodged reprint to increase. Sometimes the auxiliary effects can have a surprising impact. Take the first reprinting of Tarmogoyf and Dark Confidant from the original Modern Masters. Despite the extra copies added to supply, this set led to an increase in price in the two staples. As it turned out, Modern as a whole was catching on like wildfire at this time, and Wizards’ decision to release a supplemental product galvanized people to pull the trigger and invest in the format. So while supply was increasing, in this case demand was too—and the net effect of the latter outweighed the former. As that last example makes clear, sometimes outcomes are unpredictable. If you sold off your playset of Tarmogoyfs in the lead-up to the MMA release, you would have been disappointed to have to rebuy them at higher prices. This despite the conventional wisdom saying that a reprint would lower the price. Risk is the concept financial advisers and investors use to conceptualize these potential downsides. Basically, you never know when factors outside your control may influence a given investment. Usually risk applies to a new acquisition, not a decision to sell, so perhaps a different example will clarify. Imagine you have some money to spend on Magic cards. You already have the decks you need/want to play in events with, so you reason that buying something that will increase in price is the best choice. You do your research, talk to players in your local community, and read advice from finance writers. Your conclusion: rare dual lands in Standard-legal sets always increase in price after their block stops being drafted. You purchase several copies of the whole cycle that’s in print right now, with the intention of selling in six months. Two months later, you’re hit with a whammy: Wizards is including your speculation targets in the final set of the block, even though they were just printed this year! This exact situation happened several years back with shocklands in Return to Ravnica block. At the time financiers were advising people to buy up as many shocks as they could. Past dual-land cycles like the Scars of Mirrodin fast lands and the Innistrad buddy lands had increased the following year markedly. Shocklands were certain to follow the same trajectory, it was reasoned, and their upside was even higher due to Modern demand! Except they didn’t. Nobody had predicted that Dragon’s Maze would flood the market with even more Steam Vents and Overgrown Tombs. In the case of Magic cards, this threat of reprint is one of the perennial risks. Even when it seems quite unlikely, if a reprint does hit, you may be out quite a bit of money. Successfully managing risk essentially boils down to measuring the expected value of a given investment. The savvy investor doesn’t just consider the upside, but also the downside. The greater the risk, the more it will mitigate any potential upside. If the risk is too great relative to the gains, the investor will look elsewhere. Ultimately, risk is an opinion or a feeling and not as much of a calculable fact. You can use logic to an extent, but there will always be guesswork involved. As a result, when I say something is “risky” to keep or buy, I am basically stating my opinion. This opinion is not wholly unfounded—but my interpretation of the data may differ from yours. That doesn’t mean either of us is inherently wrong, but it does mean you should be very careful drawing broad conclusions. Finally, there is a way that risk itself can turn around and influence prices. When players believe that a card will drop in price, it can become a self-fulfilling prophecy. This usually happens in connection with an announced reprint. Take the price of Liliana of the Veil. After confirmation of her inclusion in MM3, the price began to drop. At this point the supply hasn’t changed yet, but players are reacting to a perceived drop in her value. These perception-based changes can be reversed if they weren’t well founded in the first place. In the case of Lili, of course, MM3 is now injecting supply that is lowering the price. But sometimes hype or misinformation can lead the Magic community to misevaluate a card’s price. In these cases, the price will usually self-correct later. Risk doesn’t just apply to cards you’re buying with the express purpose of speculating on. There is an inherent risk in any investment. If you intend on holding your Magic collection forever, no matter what it’s worth, then this won’t matter. But for those of us concerned about resale value, we’re skittish at the prospect of our $50 cards tanking to $20 in a weekend. The one event that can make this nightmare scenario a reality is the dreaded ban. That doesn’t mean you shouldn’t ever own, or buy, cards that could be banned. It just means, if budget is a concern, that you should consider the possibility. There are two cards in particular that I believe may carry this type of risk at this time. Remember, this doesn’t mean I think these cards will, or should, be banned. It just means I acknowledge the possibility that at a future time they could create problems in the Modern format that Wizard deems unacceptable. Mox Opal is one of the riskiest cards to keep right now from the standpoint of banning risk. The main reason I believe this is just because of how similar it is to other cards on the ban list, notably Chrome Mox. Both cards generate more mana than they cost. Both require some kind of deckbuilding restriction, but one that can be overcome without too much difficulty. When it comes down to it, nobody’s using Mox Opal in Modern to do fair things, even if the decks it appears in are fair. Right now Affinity and Lantern Control are considered of acceptable power level and metagame share, while other Opal decks are languishing in Tier 3 or lower. But imagine they print some new card that pushes Krark-Clan Ironworks up in playability. Imagine, furthermore, that the new deck is resilient, hard to hate out, and that opening hands with Mox Opal often lead to turn-three kills. 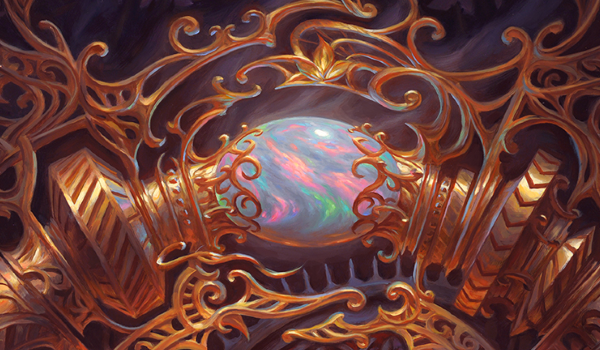 Just like that, Mox Opal may end up in Wizards’ crosshairs. Remember, we’re not saying this will happen, just that it might. Now what does this risk do to the price of the card? Well, if enough pro players start talking about how unfair Mox Opal is in Modern and decide it’s worthy of a ban (much like Gitaxian Probe), it could negatively affect players’ outlook on the card. This will cause the price to slip as people decide it’s not worth the risk of keeping. In an example of the most extreme case, look at the price graph below of Eye of Ugin earlier last year. Eye of Ugin peaked in February at about $50. It then fell continuously until its banning in April, losing more than 50% of its peak value. This despite the continuous results it was putting up at the time. Clearly players were under the impression that Eye of Ugin (or something else in the deck) was going to get banned for the sake of format diversity. This example is meant to be an extreme example but it clearly shows how public perception of a card’s future impacts its price tag. Eye of Ugin is also an example of what will probably happen if Mox Opal is banned. Simian Spirit Guide is another card I think is particularly risky to hang onto for reasons similar to Mox Opal. For all intents and purposes, Simian Spirit Guide is a lot like an uncounterable Rite of Flame. I understand this is not a perfect analogy, but for the purposes of my argument, it’s fast mana that has an extremely low barrier to make good. Seething Song was too efficient and was consequently banned, and Desperate Ritual and Pyretic Ritual are only good enough alongside Goblin Electromancer or Pyromancer Ascension. Simian Spirit Guide is a Lotus Petal in a format that really shouldn’t have Lotus Petal. It currently fuels some of the most back-breaking combo decks and frequently gets included as spice in any deck that needs a little more speed. I have seen Spirit Guide in things as innocuous as Zoo, to decks as degenerate as the colorless Eldrazi deck at Pro Tour Oath of the Gatewatch. Banning Simian Spirit Guide may be like the Gitaxian Probe ban that tries to get at the root of the problem rather than blame the symptoms. Simply put, nobody plays Simian Spirit Guide as a three-mana 2/2—it’s used almost exclusively to allow their deck to kill a turn faster than it should. If speed becomes a problem in the eye of Wizards’ R&D team, then it could get axed. The difference between Mox Opal and Simian Spirit Guide is that there’s really no demand for the latter outside of Modern. It’s a $9 common that would become bulk after a banning. While you probably have more to lose if you have a set of Opals than a set of Spirit Guides (due to the price difference of the cards), I think both are definitely cards you don’t want to own if you’re not playing with them. Past these two cards, I don’t believe there are any cards at significant risk right now of decreasing greatly in price. Much of that is due to the fact that we just had a massive reprint of Modern staples in Modern Masters 2017. We can and will see more cards shift in price in the future, and as the opportunity arises I will apprise anyone of my thoughts of new risks. We’re looking at prices for the MM2 version specifically, so the beginning of the chart represents the first week the card was available in boosters. Notice that little rebound in June shortly after the set release—this isn’t rare to see for newly reprinted cards. As you can see, despite that initial rally, Noble Hierarch continued to fall for the rest of the year. Right now we’re witnessing the same thing with MM3. If you’re impatient, the best time to buy in was last weekend. If you’re not in a rush, however, wait until December for the best prices of the year. I often feel like a broken record repeating the virtues of buying in December, but it really is the best time to get Magic cards. People are often trying to sell their excess to buy gifts, and stores are holding sales to try to get in a few more dollars before the year’s end. If you’re in Orlando this weekend like me, you should pay attention to the buylist boards at the GP. Vendors will be hungry because there was no North American Grand Prix last weekend. These buy prices will likely dictate the next six-plus months of prices for Modern Masters 2017 cards. I will be taking some pictures and posting them on my Twitter if you are interested in the most up-to-date information. Otherwise, I will be including a guide and summary of the Grand Prix in my next article. The main event is sealed so it is unlikely to cause any major stirs in the Modern world. It’s also being run by Star City Games, so there will be no SCG Open or Classic to cause drastic shifts in card prices. After this weekend there is only one premier-level Modern event before the release of Amonkhet: the Team Unified Modern Grand Prix in San Antonio. It will probably be a blast to watch, but I would strongly discourage you from taking too much from the results of this GP. The fact that it’s a team format and that you’re forced to play with a limited number of cards (i.e. the team can’t play three of the same/best deck) means the results will be pretty skewed. The next couple months don’t feature a lot of high-level Modern coverage. The next two SCG Opens are Legacy and Amonkhet Standard. We won’t get another premier-level Modern event until the end of May, when SCG Baltimore will take place on the same weekend as two Modern Grands Prix in Kobe and Copenhagen. This will be followed by another Modern Open in Charlotte, and then the following week yet another Modern Grand Prix in Las Vegas. Suffice it to say, if you’re looking to build or finish your deck in the near future, you should probably do it before the Star City Games Open in Baltimore on May 27th and 28th. With a large sequence of Modern coverage coming up after that, there are bound to be cards that see big gains and losses as players are incentivized to innovate weekly. I hope this has best explained how I feel about the risk involved in keeping cards. I know I was not the best at explaining what I was trying to say, which led to many readers thinking I wanted cards banned. If you’re still unclear or have any questions, feel free to leave them below! This was a fantastic article on an economic concept and how it applies to Magic. I also really appreciated the advice on when to pull the trigger on MM3 cards I’m interested in. I would like a general guide in the future of the best times to buy cards depending on type of product, time of the year, etc. Again, great job. If you have the patience, wait for a reprint and then wait for December is the basic rule of thumb. Quick question Jim, you mention that the best time to buy in would be in December, but also that prices are likely to spike based on performances during the summer premier events. Do you think that even cards affected by those tournament results are likely to drop back down and be at their floor in December, or are cards likely to spike tournaments best picked up before the end of May? It really depends on when you want to play with them. If you’re just collecting waiting until December is usually the best. Unless some deck breaks out (which nobody can really predict) there are unlikely to be really big shifts in card prices until more reprints happen (which again, nobody can really predict). December is by far the time that most cards hit their low due to the holidays. There are no grands prix in December and interest in competitive Magic is low as people visit family during the holidays. The Open in Louisville the weekend of May 20th is Team Constructed and one of the seats is unrestricted Modern. I’d consider it a major Modern event. The split events generally don’t have as big an impact on things, in my experience. There are just so many other variables mucking up the Modern-specific data. My guess is it will have some effect on prices, but not a huge one. I’d agree with Jason. Team events (even team unified modern) don’t really tell the whole story and are unlikely to really cause a wave of price changes. Unless a very different and very new deck is very successful it is unlikely that we see people buy into new decks. Interesting article with interesting points some which i didn’t consider previously. 1) What would u say about price trajectories for currently low priced but useful rares from MM17? I’m talking about things like Venser, Gifts, Phantasmal, etc. 2) Also what do u say about current prices of Tarkir fetches, which spiked after all the frontier madness? Is there reason to wait and hope for their prices to lower?